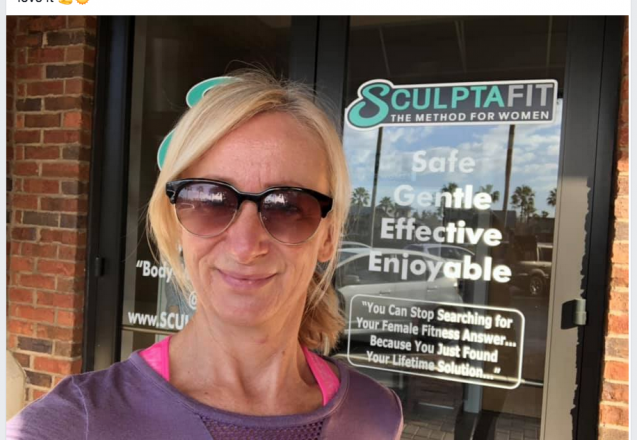 “Before I found SCULPTAFIT, I tried several different gyms and other common fitness programs. Either the workout method was too painful and really took a toll on my body (lower back pain), or it was slow, but only involved stretching, which did not help me build strength and muscle tone. I wanted something that strengthened my muscles so that I could tighten up my body, maintain a nice weight and feel healthy. Since coming to SCULPTAFIT, I lost 2 inches off my hips just over the last 3 months and I feel much stronger and tighter. And I never feel back pain or “wrecked”, which is wonderful. Getting results without killing myself. My husband has noticed the difference too! The controlled movements safely work our muscles to their limits without feeling forced. It makes the body stronger and tighter without the risk of injury. But most of all, the inspiring attitude of all the coaches lifts my spirits and keeps me coming back. I also love the FIT-Q check-ins which is a great way to keep us in tune with our wellness improvements and fitness progress. Would you like to see how it feels to do a gentle, enjoyable, proven fitness program for women? 3 – On a limited basis, we are now offering private 1-on-1 ‘Strong & Healthy’ Personal Fitness Training for people who need exclusive attention and special guidance. Call or text us at 904-891-3680 for more information on how we can help YOU. If you’re struggling with your personal fitness – worried about your health status – frustrated by lack of success with things you tried in the past, concerned about your wellness and what the future holds for you… Then reach out to us ASAP. We are here for YOU. This is what we do – and we are the BEST at what WE DO. We care about your life, your health, your longevity. And it’s our mission to guide you safely, properly and successfully to your best fitness and wellness goals. The only thing you’ll regret is not getting in touch with us sooner. It’s NEVER too late to do the right thing. You still have lots of life ahead of you if you take wise action now. My Wife Is Sparkling Again Like She’s 20 Years Younger! Nikki, please share this email with the coaches and Joey as well. 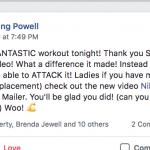 Two months ago, when Alice first started her fitness and wellness sessions at your studio, I was actually very surprised. She was very reluctant in the past to try something because she was scared or insecure, and maybe rightfully so. But the more she heard about your unique and safe method, the private studio and the stories about the other women like her who were having great success there, the more interested she became in trying it. When she asked me, I was fully supportive of her to go try your free sessions, because I could see her health deteriorating, her energy dropping and her overall mood getting worse over time. On top of that, her mental clarity and her simple willingness to do fun things and travel was decreasing as these last few years have gone by. I think the last visit to her doctor for her annual physical was the extra push she needed to come start with you guys. 3 of her vitals were worse than last year and she became pre-diabetic on top of that. The doctor said “you need to do some form of exercise”. So fast forward to now and I have to say, she is like a new woman; the woman I knew from years ago. She’s sharp again, can do so many things, her body is changing, her posture is beautiful, her energy is incredible (during the day or nighttime, lol) and she has this happy sparkle in her eyes that reminds me why I fell for her years ago. Our kids are ecstatic about her rejuvenation because we have grand-kids and we plan to spend more time with them, especially as they grow and become more active. We want to be around for them and be able to do things with them. What’s great is that she now knows she is in control of her health and longevity, and your team has made this all possible. I don’t know what else she could have tried that would have worked for her like this. Even better is that all our friends are noticing the changes and 2 of her friends have already gotten started with you as well. You really have something special going on there and we are forever grateful that you are local. We are so excited about the present and very enthusiastic about the future. Many blessings to the whole team and all the lives you touch. Want to See What Alice Is Doing? 5 – How both women and men can take simple, doable steps toward reversing the aging process, adjusting the mindset, regaining lost abilities, and re-awakening the you of years past. 6 – And many more revelations that will inspire, awaken and motivate you to take positive action TODAY. 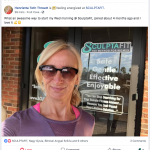 She knew it was time for positive change and SCULPTAFIT sounded like THE ANSWER. Click play to hear straight from Jill – about the amazing progress she has made in just a few months. To put her current success into perspective. In this photo I’m holding an anatomically correct replica of 5 pounds of excess body-fat. Jill has dropped 4 of these slabs OFF her body!